The original Flip Video mini camcorder was a game changer. Though arguably outwardly bland, its incorporation of user-friendly USB connection arm, High Definition capability and just as importantly, asking price circa £100 – at a time when conventionally styled HD camcorders were retailing for £600+ – captured the imagination. Inevitably conventional camcorder manufacturers, including JVC, have followed suit and issued their own 'HD video on a budget' alternatives. Including the Panasonic DMC-TA1 and Sony Bloggie Touch. 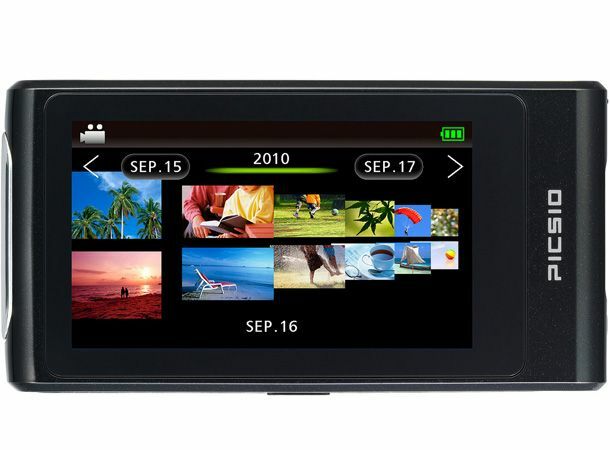 JVC's latest Flip batterer, the £160 Picsio GC-FM2 HD Memory Camera, goes up against the Flip Mino HD, and differs from the FM1 by replacing that model's physical controls with virtual ones via a 3-inch widescreen ratio touch screen. The clear 230k-dot resolution panel takes up almost the full length of the backplate. The Picsio's plastic-y and toy-like when held upright in the palm, broader in depth than the average handset. Headline spec includes Full HD 1920x1080 pixels MPEG-4 format video at 25fps, five megapixel stills, and (via a side flap that flips open like a TV tuning panel) HDMI and regular AV output. Footage is saved to SD/SDHC/SDXC/Eye-Fi cards, although there's a 128MB internal capacity given over to pre-installed software and manual. A quick start guide is provided out of the box, and there's no additional CD ROM. Operation is very much 'plug and share'. The Picsio appropriates a rather stiff slide-out USB connector (with supplied extension cable) at its base for downloading files, uploading to YouTube, and re-charging the integral (non removable) battery. Switch the device on via the power button at its side and globule-like icons appear floating on-screen, offering a choice between video and snaps. Press the former and disappointingly, the image before the lens is squished into a narrow portion of the screen, the lion's share given over to the JVC's virtual control panel. When playing back footage, the full screen can be utilized, but it's a shame you're forced to squint at smaller details when recording. When shooting outdoors, the built-in microphone makes the slightest breeze sound like you're battling 100mph winds. Plus, if you use the 4x digital zoom the video takes on a distinctly painterly appearance as definition is lost. Photographs are more noticeably grainy, and camera shake and resultant image blur is a problem if shooting indoors despite JVC's claim of a better low light performance and theoretically bright f/2.8 fixed focus lens. So this is not a replacement for your stills camera. Video at full (non zoomed) resolution fairs better, and, while the framing provided by the LCD when recording is pokey, turn the device on it side and, by contrast, being able to share footage utilising the full width of the screen provides a real wow factor. While the Picsio is no match for a conventional camcorder with a sharper, better quality lens and optical zoom costing a few hundred pounds more, for those who just want to record occasional clips as a memory jog or snapshot – basically to use the JVC as a bit of fun, it's good enough. Ultimately the mantra 'you get what you pay for' applies here. Not a quite 'Flip killer' then, more a near doppelganger with funkier touch panel interface.